A few people on Twitter have been talking about this and I found an article in Turkish with some background on the closings due to pollution. Here's some of the info from the article (note though that the timing is very suspicious, being the 10-year anniversary of the 18 Tir student protests). Air pollution in Iran's capital of Tehran has reached dangerous levels, bringing about negative effects on everyday life. With the effects from sandstorms in the west of the country as well the existing air pollution in the city has reached dangerous levels, and administrative and educational institutions have been closed down for 24 hours, and industries for 48 hours. If necessary this could be extended to 72 hours. The Ministry of Health says that Tehran, one of the most polluted cities in the world, has only 21 clear days a year. At least 87% of the air pollution in the city comes from vehicle exhaust, and every day a large number of people check into hospitals due to illness from the air pollution. 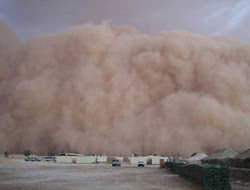 Some other cities in Iran have seen flights within the country cancelled due to sandstorms. Also, here's a video of the Allaho Akbar chants from last night (the 5th). There are quite a few of these so note that the person doing the recording makes sure to refer to a recent event (a crashing of a monorail in Disney World) to help make sure of the date. One other piece of news that has gone a bit under the radar: Iranians around the world are signing green pieces of cloth that say "Ahmadinejad is not our president" that are to be joined together later on to be hung on the Eiffel Tower. In Dubai though Iranians have been prevented from doing so and are now thinking of how best to get the cloth signed. My guess is that they will simply find a way to do it in a less obvious location than the one they had chosen before - on the beach in a fairly prominent location.